As business travelers, we easily get exhausted after a long day of meetings and events – which makes it very important for us to relieve fatigue before starting a new day. How we relax differ from one person to another; however, the following items are a sure way not only to unwind but also a great opportunity for some immersive Korean culture experience. Many locals find a quick visit to the jjimjil-bang, Korean traditional spa, the best way to escape the winter cold and wash away fatigue while soaking the body in over 36~40°C hot water. It is a 24-hour, gender-segregated bathhouse offering a relaxing hot and cold soaking pools, bathing and massage areas, various saunas, entertainment lounges, and communal sleeping rooms. There are many jjimjil-bang in Korea; however, after being featured in the New York Times as a cultural staple of the Korean bathing lifestyle, the Dragon Hill Spa has become the most popular bath house most especially to first time visitors. It is located in Yongsan and can be reached 20~30 minutes by car anywhere in Seoul. Here, you can enjoy a diverse selection of activities to restore your health and wellness. These include more than 10 spa zones, including salt rooms and outdoor bath, and spa treatments, such as traditional Thai massage. The place also has a restaurant that serves traditional Korean foods, making it easy for visitors to stay for another day. If spa is not your type, perhaps a stroll to explore the history and culture of Korea would make a good choice. You can jumpstart with a tour of the five Grand Palaces of Seoul built during Korea’s historic Joseon Dynasty (1392-1910) followed by a short trip to the Demilitarized Zone (DMZ) in Gyeonggi-do. Gyeongbokgung is the first and largest palace built it Korea. Its name translates as ‘palace greatly blessed by heaven’ and offers many attractive traditional architecture you can’t take your eyes off. In addition to historical architecture and beautiful gardens, you can also check out the National Palace Museum of Korea located right next to the palace. Make sure you don’t miss the Royal Guards Changing Ceremony taking place at the main gate every 10 am and 2 pm! Once you’re done acquainting with the ancient past of Korea, it’s time to get things in action by visiting the last remaining border of the cold war. The Demilitarized Zone (DMZ) is a weapons-free buffer zone between North and South Korea that was established in 1953 when the Armistice Agreement was signed during the Korean War. DMZ is a heavily secured area thus if you want to visit the site, you need to book a packaged tour in advance. The site has always been a very popular place to visit, most especially now that there is a strong effort to establish peace in the Korean peninsula. Through the tour, you can see North Korea from the Dora Observatory, and actual North Korean soldiers standing in Panmunjeom/Joint Security Area (JSA) where the border of North and South Korea exist. You will also have a chance to go into the 3rd tunnel, an invasion entry dug by North Korea, where approximately 30,000 soldiers can move through per hour. If the DMZ is too far for you, the War Memorial of Korea is also a good chance to learn about a very important history of the country. Shopping has always been one of the best ways to relieve stress and fatigue to most people. Seoul is the city of shopping that offers various venues to shop in different themes, starting from high-end products to cheap, affordable products. Also known as the ‘Beverly Hills of Korea’, Gangnam is the place to be if you are seeking for a premium fashion shopping experience. Here, you’ll be able to find Seoul’s upscale and modern center packed with all the designers’ labels. Especially in Apgujeong Rodeo Street, located on the north side of Gangnam Station, where you’ll see a high-end shopping road featuring luxury brands, as well as secondhand boutiques of branded items. Myeongdong and Dongdaemun, located north of the Han River, which cuts through the center of Seoul, are also the two famous shopping spots. From cheap but good quality skin care & beauty products to delicious street foods, Myeongdong is the shopping paradise to stay for a whole night after the meeting. Another place for shopping, Dongdaemun – meaning the east gate of Seoul – is well known as the venue hosting Seoul Fashion Week. A full range of fashion items that cover head to toe can be found in Dongdaemun at relatively inexpensive prices! Having an elegant dinner looking at the urban nightscape makes a perfect reward after a hard day’s work. Whether you’re wishing to enjoy the night view along the riverside or above the sky, we’ve selected three places in Seoul to satisfy your needs. On the 81st floor of Signiel Seoul, a luxury hotel located inside the Lotte World Tower, there are restaurants that offer its guests an accessible and unique gustatory experience through premium cuisines. One of the restaurants, STAY – a Michelin 1-star French cuisine restaurant – provides not only unforgettable course meals but also bespoke desserts that maximize guests’ satisfaction. In another restaurant, BICENA – a classy Korean restaurant – visitors can have a unique Korean dining experience that shows the oriental beauty inside the dish. Meanwhile, after the dinner, visitors can enjoy various liquors at Bar 81 – an upscale champagne bar – with a panoramic sky view. 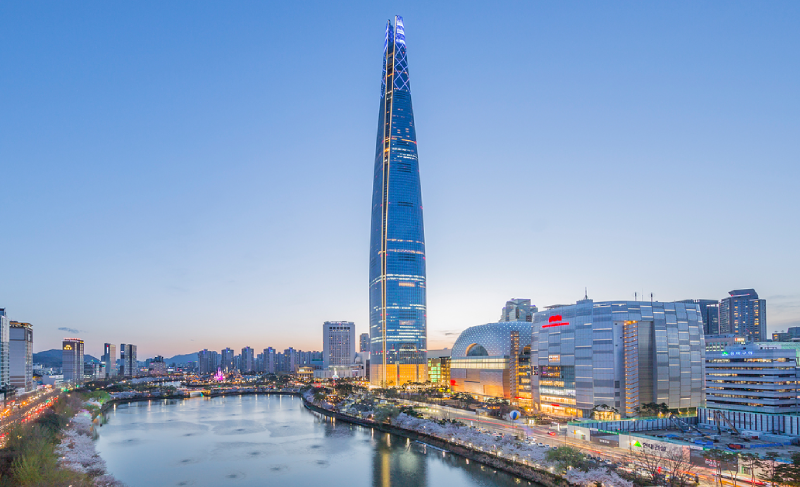 63 Building – an iconic landmark of Seoul – offers a marvelous night view of the city with the highest quality of food and services on its 57th, 58th, and 59th floor. 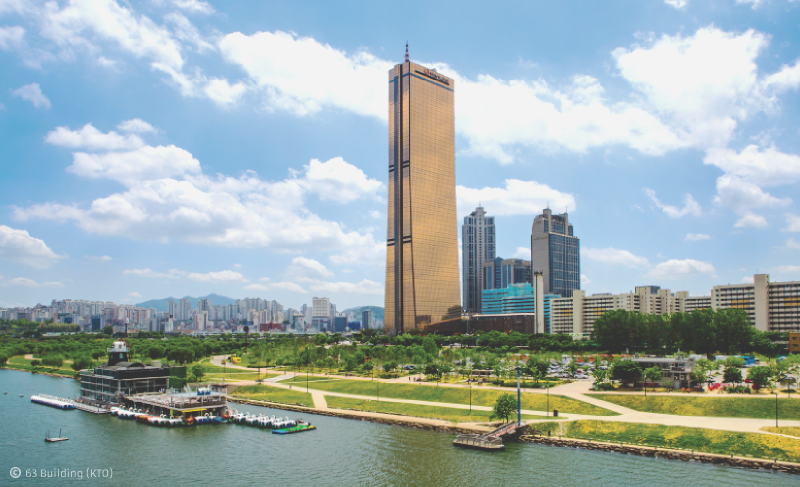 As the building is located at the west side of Seoul, the scene provided here is very different from that given by Lotte World Tower. With bridges connecting the north and south of Hangang River in the middle, the view boasts one of the most beautiful nightscapes of Seoul. Also, here, you have plenty of dining options including French, Japanese and Chinese. 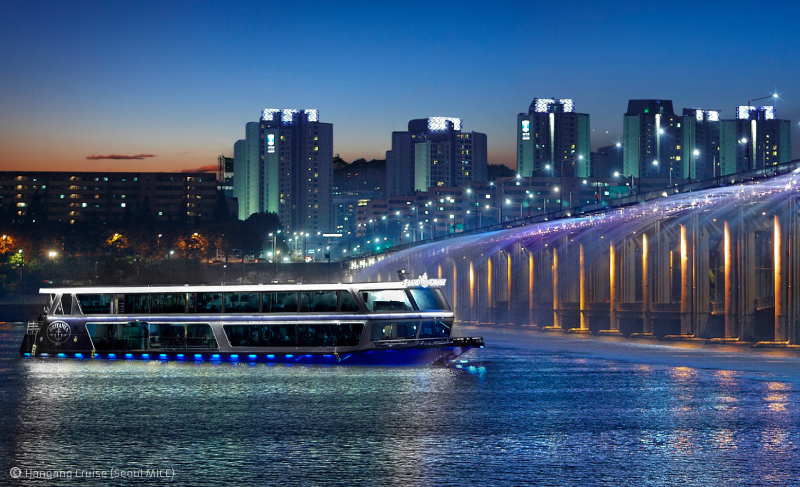 Unlike the two places mentioned above, Hangang River Luxury Ferry Dinner Buffet Cruise, offers guests to dine on the cruise, see spectacular night views of Seoul along the riverside, and enjoy jazz guitar music played by live performers. As the trip takes about 70 minutes, you will have enough time to enjoy the buffet, which has an excellent selection of over fifty delicious dishes. You might want to schedule your break on Saturdays or special holidays since they’ll be doing a fireworks display. Spain – Greetings from the Villa Padierna Palace Hotel in Marbella!